Ladies and gentlemen, dear friends and colleagues let me first take the opportunity to wish you all a prosperous new year. 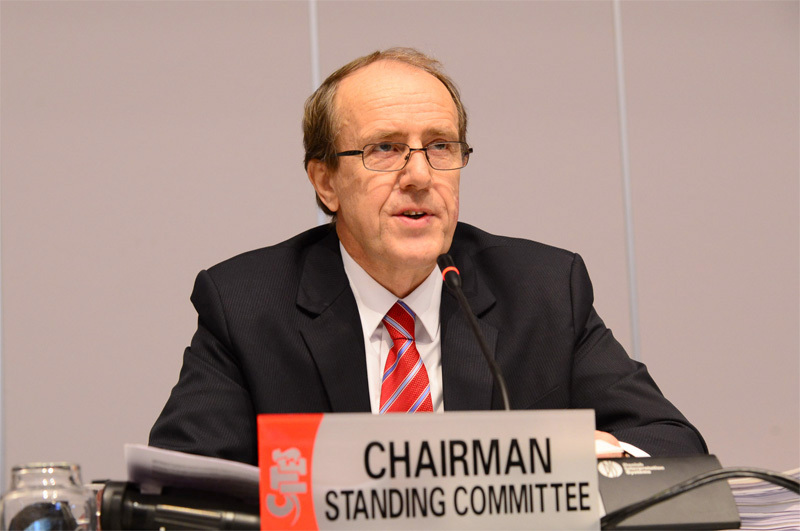 I also welcome you all to Geneva and this 66th meeting of the CITES Standing Committee. Preparations for SC66 have been in the pipeline for a long time now, with the many working groups, within the Secretariat and among many IGOs and NGOs. As you know this is the last main meeting of the SC before CoP17 starting late September this year. Albeit we will of course have a brief one-day SC67 meeting on the day before the CoP. This week’s meeting must focus on concluding issues to be presented and finalized at our main decision making body, which is the CoP. In reviewing the Agenda and papers for this meeting, I have come to realize that for various reasons some issues might not be finalized at this meeting. As a result, the Committee may be faced with the prospect of having to return to some issues after CoP17; to be finalized by CoP18. CITES is as contemporary as ever. Over the last few years we have seen enormous progress. If you ask me, what are the most remarkable achievements over the few last years? The first one that comes my mind is the NIAPs. They have proven to be an innovative and highly successful approach to dealing with a complicated and multi faceted problem. As a flagship species, elephants play an important role in pushing for better compliance and enhanced domestic actions, which surely must be good news for many species. The second initiative that comes to mind is the fact that CITES itself has steadily built many strong alliances with many other organizations with the aim of helping Parties implement CITES and meet their compliance challenges. Lets face it, CITES alone cannot possibly achieve what we aim for, we need strategic and innovative approaches and alliances. The third remarkable achievements are the two UN General Assembly resolutions; on 30th July 2015 the UNGA adopted resolution 69/314 on Tackling illicit trafficking in wildlife. On 25th September UNGA adopted resolution 70/1 on Transforming our world: the 2030 agenda for sustainable development, which also include the sustainable developments goals (the SDGs) and related targets. CITES could not hope to get better high-level political focus and support than what is included in these two powerful UN resolutions, which build on the outcomes of Rio+20. In other words, CITES now has the attention of politicians at the highest levels and this is a new and unique position for CITES. To put it bluntly: this is the time to enable the CITES Parties and Secretariat to draw upon this top-level political support to make major strides forward in achieving full compliance. This week’s meeting and the coming CoP is very much about this and how we must capture the moment to strengthen compliance with CITES and deliver real progress at national level, and in so doing help to realize the ambition of these two UN resolutions and deliver on CITES CoP resolutions and decisions. As your Chair for the last 6 years, I have come to know and respect the professionalism of the Secretariat. I think we are indeed lucky to have such a dedicated Secretariat. Our Secretary-General John Scanlon joined the Secretariat at approximately at the same time as I started as your Chair and his outstanding achievements have been acknowledged by myself and others, including UNEP. I believe that you who know him will share that sentiment. John has a very good understanding and strategic view of how to advance CITES and has been instrumental in the way CITES has developed over the last years. All the good initiatives mentioned here and others, have not come about by accident, but have been part of our strategy and guided by John and his staff. I do not claim that our tasks have been completed. As this meeting will testify to, there are still many issues to rectify. CITES Parties and the Secretariat will continue to provide support, to the best of our abilities, to those Parties that are facing compliance challenges, and we will continue to collaborate with relevant IGOs with common visions and we shall welcome initiatives from NGOs and others. All of this work must also respect the differing mandates of CITES and collaborating partners. Areas where I see a real need for enhanced efforts is the fact that many countries are the subject of compliance measures, including trade suspensions, and many countries are still in category 2 or 3 under the national legislation project. Many countries still need to develop their legislation, many need to strengthen their CITES offices through both staffing and funding. We also see the need to strengthen police and customs control and for the judiciary to impose appropriate sentences for serious wildlife crimes. Some of this can be addressed through the ongoing processes under CITES, under the new funding allocated through the GEF (Global Environment Facility), as well as through the development of NBSAPs under the CBD. Identifying weaknesses and then seeking out collaborative partners and financing to address these issues should be a priority. This is what I want for the New Year! On concrete issues for this SC, we may reconvene several Working Groups to allow them to complete their work and I refer you to Information document 17 Rev 1, where you will find the membership of each group. We will also need to establish a Working Group on captive breeding issues. The membership of this Group must be kept within reasonable limits, so please give some thought to who might be best placed to represent your viewpoint on this group, as I will not include everyone. Colleagues, as mentioned earlier we must conclude all of the SC pre CoP work this week given the deadline for submission of CoP documents is 27th April. If we do not conclude any particular item I will report this to the CoP. So please use your best endeavors to have all of our work concluded in time for final adoption this week. In doing so, I also ask you to have regard to Resolution 4.6 (Rev CoP 16), including the requirement for the inclusion of a budget and source of funding where there are budgetary or workload implications for the Secretariat or committees. In this context, I should remind you all that any Party or Parties can bring issues themselves to the CoP, but they must also abide by the set deadline. This could be a solution if some Parties think that a particular issue should be brought to the attention of CoP17 that is not agreed by the Standing Committee. Over the next five days, I will as always, conduct our business giving first priority to the members of the Standing Committee, as is expected under our Rules of Procedure. However, as you know, I am also interested in the active involvement by Observer Parties, IGO’s and NGO’s. Having seen the length of our Agenda, I am sure you all realize that there is a risk that we will going to be short of time, and therefore there is a need to rationalize the time spent on different agenda items and how many representatives that can take the floor on any one item. So please respect my request for time limits to interventions and other requests made during the meeting and I ask that you forgive me in advance for not always being able to give everyone the floor but time constraints will simply make this impossible. In this context, I request the NGO observers to confer amongst themselves about who might best represent their viewpoint on different agenda items, as I will not be able to give the floor to everyone. Given the length of the agenda we will not take any coffee breaks, while we shall of course have our lunches. Today the meeting will go on until 6.00 pm. So please arrange for this your selves accordingly. The almost overwhelming pile of issues and documents for this meeting testifies to the enormous work done by various working groups, consultants and the Secretariat. I sincerely thank all of those for their efforts. Dear colleagues, I conclude this opening speech by welcoming your strong support for CITES and by encouraging you to participate in this week’s discussions in a spirit of collaboration and with a willingness to listen to, and respect, alternative viewpoints. I also thank the Secretariat for all of its hard work in preparing for this meeting, which is the largest Standing Committee meeting we have ever had.